Hyundai is claiming a 250-mile range for U.S.models of its new Hyundai Kona EV. That places the small crossover slightly ahead of the Chevrolet Bolt’s 238 miles and the yet-to-see-daylight standard Tesla Model 3’s 220-miles in the race for range. The Kona EV was introduced earlier this year at the Geneva auto show, but U.S. specifications weren’t offered at the time. 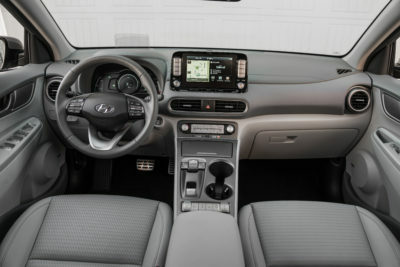 That changed at the New York show this week, with Hyundai announcing the range figure as well as battery and power output data. The company also said the U.S. version of the Kona EV would first be available in California, at the end of this year, with national rollout to follow – coastal areas first. 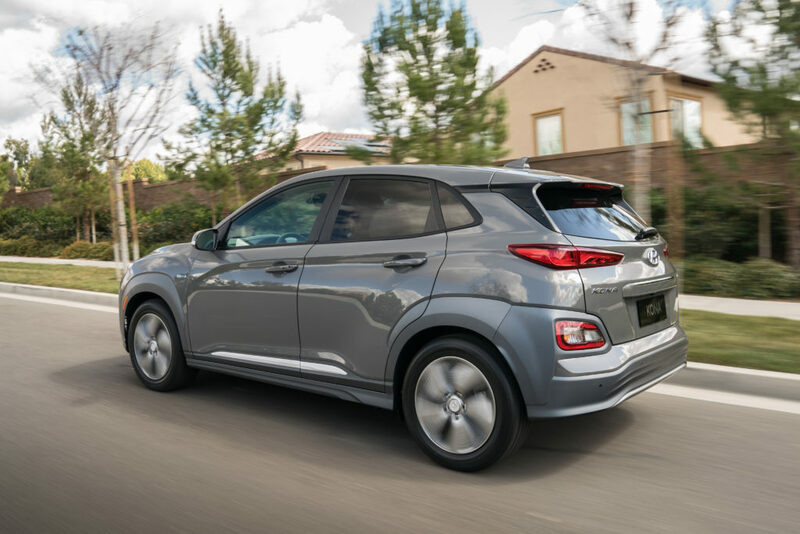 The front-wheel drive Hyundai Kona EV will come to the states with a 64-kilowatt-hour battery and a single motor providing a peak 201 horsepower and 290 lb-ft of torque. That makes the EV more powerful than the top trim levels of the gasoline Kona with the turbocharged 1.6-liter engine. Hyundai says the Kona EV can be charged overnight (9.5 hours) on a 240-volt, Level 2 home charger and can be topped up on the road with an 80 percent battery refill in just under an hour on a Level 3 DC fast charger. Hyundai uses the SAE Combo socket for fast charging. Style-wise, the Kona EV looks pretty much like the standard Kona, although the front grille has been replaced with a patterned, body-colored panel. 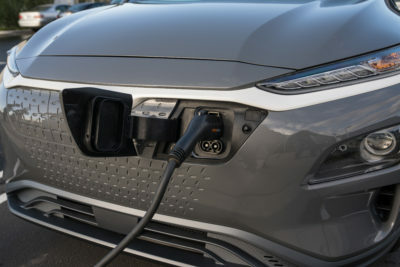 The charging port is on the front of the car, hidden beneath the upper grille panel, making it easily accessible no matter which side of the car the charging station’s on. The Kona EV also gets its own wheel design. 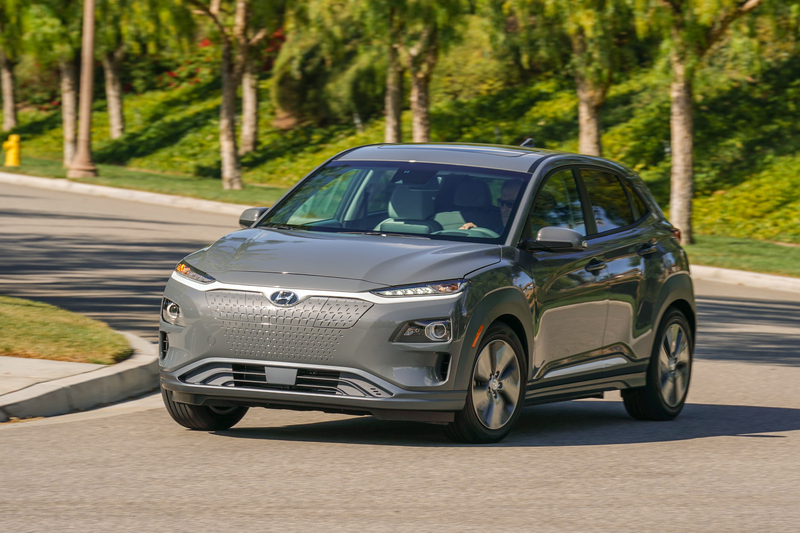 Hyundai hasn’t yet announced pricing for the Kona EV – we expect it to come in below the $37,500 Bolt and the $35,000 base Tesla Model 3, though.